Apple's products rarely benefit from massive discounts after just one year of being available on the market. However, if you couldn't afford the last year iPad Pro 9.7, here is a deal that will allow you buy one without having to break the bank. Well, at least not a big bank since the tablet still costs quite a lot. 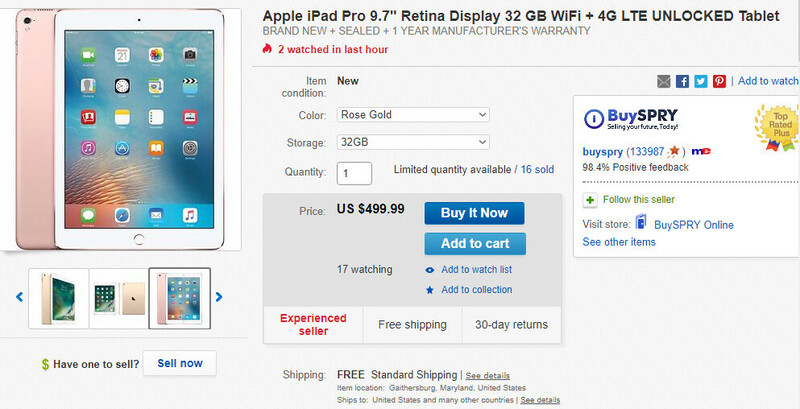 One eBay retailer sells the iPad Pro 9.7 32GB Wi-Fi+LTE model for just $499.99, though the tablet is usually available for $730. Customers who decide to go for the deal will save $230 when they purchase the iPad Pro 9.7, which is available in Rose, Rose Gold, Silver, and Space Gray. If you still can't afford to purchase Apple's iPad Pro 9.7 32GB, then you might consider Best Buy's promotional offer. The US retailer sells the same model for just $479.99, but you will have to commit to a new 2-year agreement with Verizon. On the flip side, you'll be saving no less than $250 when you purchase the Verizon iPad Pro 9.7 32GB. These deals are available for a limited time or until supply lasts, so decide fast on whether or not to take advantage of any of them. Even with a discount and taking on the risk of no warranty, it's still expensive. Apple is just too rich for my data. Drop the price below $200 CAD, and I'd proudly recommend this to students, as it could certainly replace all their needs for notebooks (with the $150 CAD pencil sold separately), while doubling as a media consumption device. Anything higher, it just looks like an overpriced joke when compared to the similar priced Windows competition, given how limited its phone OS is. Yeah, because it's designed as a mobile device. Not as a laptop/tablet hybrid. Every device is not the same but that doesn't mean one has a complete advantage over the others. For example, find me a windows hybrid with a better processor than the A9X, at $500. See what I said? On the other hand, iPad Pro 9.7 doesn't provide the productivity at that price. +1 If being used as a pure tablet only, nothing beats the iPad. A pure tablet also has advanced productivity applications that you simply can't get from a Laptop/Desktop form-factor. Have a look (http://sck.pm/g9p ). I think people have a tendency to think "pure tablet" means it should be gimped in functionality and only be used for consumption. Which is far from the case. Merely apple doing that to force you into buying multiple devices. "Not as a laptop/tablet hybrid." Right, is that why apple has been advertising it as "better than a computer", "PC replacement", etc.? What you think it is doesn't change what apple is advertising it as. "For example, find me a windows hybrid with a better processor than the A9X" The 5th gen Intel Core i3 chipset in the Surface Pro 3 already performed better than the A9X in terms of graphics (https://sck.pm/Sh ), not to even talk of the higher performing 5th gen i5 chipset in the Surface Pro 2 or Pro 3. Both i5 devices can be found for similar price if not cheaper, with over double the storage (+ storage expansion). Nothing special about the A9X chipset in terms of performance, just 'cause it beat x86 chipsets in GeekBench, a benchmark that favours ARM chipsets, doesn't mean it's better performing all around (https://goo.gl/FGarVk ). Same thing with the A10X. However, it does show its strength in battery life for sure, I'll give it that. Now in terms of what you can actually do with that horse power, everything it does is doable on Android Smartphone like the Galaxy Note, just a bigger screen. Paying such hefty price merely to do simple things with no option to do serious things makes it look like an overpriced joke when you compare it to the Windows competition. At a lower price, I'd definitely see it as a great device. Dude, you gave me a link of some guy named Mirza Ghulam Ahmad, https://redirect.viglink.com/?format=go&jsonp=vglnk_150039716171718&key=e6267adb62f09ba119b3951fae25e376&libId=j59tanrr0101uf0k000DA7j6nmgrf&loc=https%3A%2F%2Fwww.phonearena.com%2Fnews%2FDeal-iPad-Pro-9.7-32GB-is-less-than-500-on-eBay-Verizon-model-costs-480-with-contract_id96123%2Fcomments&v=1&out=https%3A%2F%2Fsck.pm%2FSh&ref=https%3A%2F%2Fwww.phonearena.com%2Fnews%2FSamsung-reportedly-scores-Apples-chip-business-back-7nm-A12-processor-in-tow_id96132%2Fcomments%3Fpost%3D1693956&title=Comments%20for%20%3A%20Deal%3A%20iPad%20Pro%209.7%2032GB%20is%20less%20than%20%24500%20on%20eBay%2C%20Verizon%20model%20costs%20%24480%20with%20contract&txt=https%3A%2F%2Fsck.pm%2FSh Where's the evidence of an i3 having a better GPU than the A9X in that article?? So I read that second article and I came to realise I've read it before too. But that doesn't bring up a problem for me since I was generally speaking based on real world tests using games and other media. Which means that my statement was very vague. You see I cannot write every way in which A9X loses and wins. Therefore I wrote it's more poweful on a general basis. And my mistake, I should've mentioned that I was talking about $500 devices that are currently in production. Obviously one can find used Core i7-6700k devices at that price too, so that I didn't want to consider because it will be unfair for the iPad Pro. Looks like you got angry due to my words. I can't do much abut it other than mentioning I wrote everything generally because that's what matters to the end user. Not the technicalities. Even then, let's end it here. Lol, wrong link, was doing some research on that guy before. Here's the link I meant to post ( http://sck.pm/g9p ). Yeah, in the end, people buy what they like. I just said I'd proudly recommend it if it were cheaper. It's a great device if you ignore the price, but I just much prefer getting great bang for my buck. Yup! That's the right link. Thnx for clarification. +1 for keeping it real and level headed. Productivity for the price point? No. But it does offer a stable device that's a lot less likely to crash, or is prone to touch interface and/or latency issues with pen recognition. With them wanting $20/month for tablets on unlimited data plans I'll pass.